East Lancashire LDWA - When will Spring Spring? Sunday March 4th. Around Edale. 16 miles from Mam Tor c.p. Leader: John Jocys. 11 Walkers. The Mountain Weather Information Service (MWIS) forecast for the Peak District wasn’t good, sadly it was quite accurate. At 9am, 11 walkers + no dogs, all wrapped up and ready to face the elements, headed up from the NT car-park on Rushup Edge to the top of Mam Tor for the obligatory photo-shoot. Bet you can’’t guess which way the wind was blowing! Sleet and snow made their appearance virtually from the start of the expedition as we headed north-east along the ridge to Hollins Cross where there were no views, despite what the O.S. map suggested. The sleet and snow were both sleeting and snowing. And it was cold. And muddy. After Lose Hill the party descended towards the outskirts of Hope and thence uphill in the direction of Win Hill. The weather was so poor that it was decided to give the top a miss. In consideration of this a tea-break was called in the relative shelter of what can only be described as a hole in the ground. An unhealthily enormous scone was spotted at this point…..although it soon disappeared. Continuing along Hope Brink to an anticipated brew-stop at the guide post at Hope Cross we decided the bad weather would make any ‘rest’ stop very uncomfortable. We carried on for a couple of miles to Edale Youth Hostel where we managed to get a little shelter in the lee of the building. It was still sleeting and snowing. And it was still cold…..and by this time all the members of the expedition were coated in layers of glutinous mud in varying degrees. Passing the Nags Head in Edale, our party followed what used to be regarded as the Pennine Way Bad Weather route, but now seems to be the standard route. At Upper Booth we headed (muddily) south (ish) to pick up Chapel Gate, a reasonably well-surfaced track that eventually took us to the ridge above Rushup Edge. Before our ascent began, yet another enormous scone was spotted – but disappeared almost as quickly as it had appeared. Very strange. On the ridge the group turned east on the final leg of the walk. Fortunately the sleet, snow and biting cold wind attacked us from behind but it was rather uncomfortable. The ground was still muddy. And then we were back at the car park. As I write this report the day after the walk, the sun is shining and a pleasant day is promised. Wednesday March 7th. Geoff's Last Drop Tromp. 14 miles from The Last Drop. Leader: Geoff Halliwell. 20 Walkers and 4 Dogs. Despite an uncertain weather forecast, twenty people and four dogs arrived at 10am on the Last Drop car park. It was only fourteen miles and a quick show of hands confirmed Geoff`s idea of making it a one stop walk, for lunch only. We left the Last Drop, heading north along the very muddy Rotary Way, as far as Dimple Hall, before descending, via a path below Delph reservoir, into Longworth Clough. The mud gave Norman the opportunity to dock the usual five points! Onward to Ornamental Lodges and the outskirts of Belmont village prompted Geoff to ask the group a question : " Prior to 1804, the village of Belmont wasn`t called Belmont, what was it`s older name?" Puzzled faces and head scratching didn`t help to deliver the answer, so Geoff had to enlighten us - it used to be called "Hordern". That reinstated the docked five points, and Geoff was back to a respectable twenty points. By this time the northwesterly wind was blowing hard and a quick decision was made to call an early lunch stop at the newly refurbished Belmont reservoir dam. After lunch, a gruelling couple of miles in the strong wind took us along Catherine Edge, before turning east to ascend Turton Moor. Once there, the biting wind abated and easier walking followed all the way back to the Strawbury Duck at Entwistle. 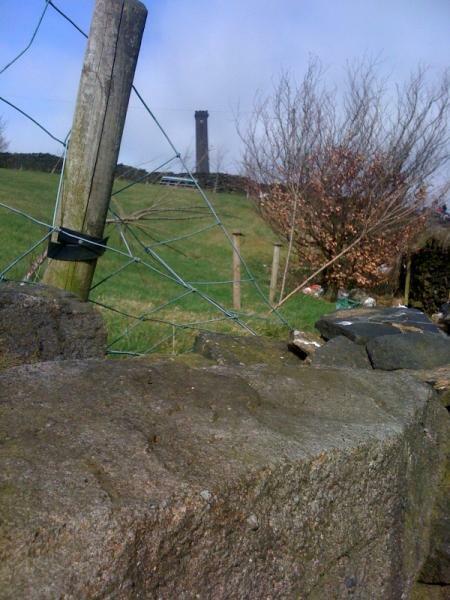 From there, we headed for Green Arms Road and the track down to Turton Tower. A final push took us up past Torra Barn, over the golf course and back to our starting point at the Last Drop. A couple of the group then checked their GPS and announced the walk had actually been sixteen miles, not the advertised fourteen. Ah well, as we always say in the LDWA, what`s a couple of miles more when we are having so much fun !! Sunday March 11th. Two Crosses Marshall's Walk. There was a grand total of six walkers on todays marshalls walk. Peter Haslam, Dave Shepherd, Andy Hayhurst , Paul Wadsworth and myself Andy Griffin. As it was the marshalls walk there was no walk leader but we all stayed together until Turton Tower where Dave set off at pace to do the long route on his own. We continued to Entwistle Reservoir for a stop at the camping barn. The climb up onto Wet Moss was boggy as usual so a good couple of weeks weather will help. Once on Holcombe Moor the sun started to shine and lunch was taken below Peel Tower where a crowd were watching people abseil down it for charity. We were back at Laurel St for just after 2.00pm. Everyone enjoyed the walk. Spring has definately sprung. Wednesday March 21st. Thirty-Six Degrees Part 3. Despite the final destination of this walk being shrouded in mystery,at least we knew this particular section would be finishing in Affetside where we had to leave our cars and travel to the start at Castle Drive , Adlington in some luxury (a Coach). After our refreshments marching speed was achieved as we headed off through Rivington towards and across Georges Lane and on to Winter Hill. We assumed we were going over the top. John,our leader (who is keeping his cards very close to his chest on these walks) had other plans and we turned right off the road leading to the mast and made our way down to Walker Fold. Our route from here took us across Walker Fold Road, Smithills Dean Road and on to Horrocks Fold with a brief stop for lunch. We had all noticed that we were maintaining a fairly brisk pace (we subsequently finished the walk 30 mins earlier than anticipated) but then discovered that Sgt-Major Norman Thomas was putting young Bernard “the milky bar kid” through his paces in preparation for the forthcoming 2 Crosses challenge. Poor Bernard, his training regime is so strict that he had to furtively eat his Mars Bar when Sgt Norm had his back turned ! At Horrocks Fold we crossed Belmont Road, over the fields to Dunscar then followed Eagley Brook down to Bromley Cross – where we surfaced not far from the railway station. 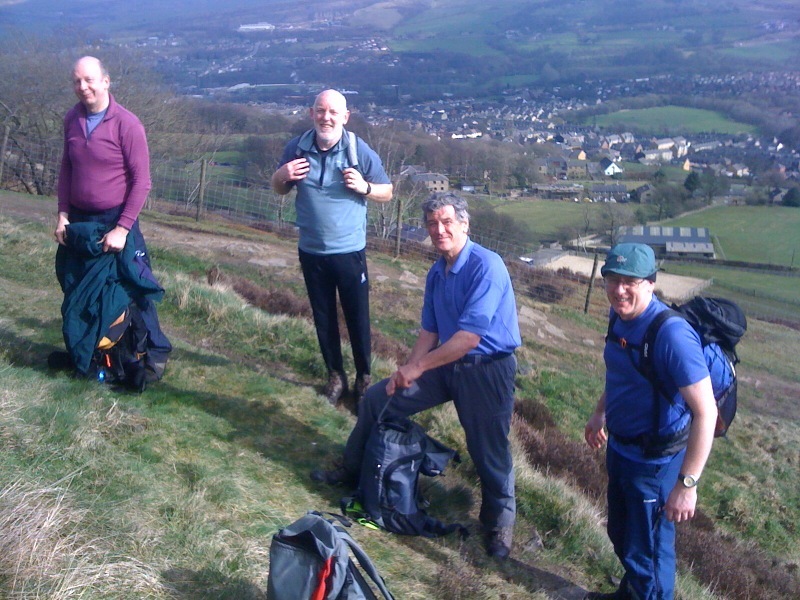 We were now on our last legs,oops - on the last leg – of our walk which took us down Shady Lane,across Bradshaw Brook at the south end of Jumbles Reservoir, over the Bolton-Ramsbottom Rd and across the fields to Affetside. We all piled in to the Pack Horse for a welcome pint and chat about the days walk and there was definetely a feeling of well-being. Indeed we were moved to compliment Jim on his healthy rosy glow – after all it had been a fine and (latterly) sunny day. Alas,it soon became obvious that his glow was as a result of his seat next to the open fire and not the exertions of the walk ! Thanks to John for a smashing walk.